If you want to visit some of the most beautiful islands in the Adriatic, you are in the right place. Join us on Ravnik, Budikovac, Pakleni and Hvar. This unforgettable journey begins in Trogir or Split. After 90 minutes by boat, we arrive to Biševo and arrive at the Blue Cave. The price includes a Blue Cave ticket, so we do not have to waste time waiting to buy them. On the south side there is an underwater hole that looks like a bow. 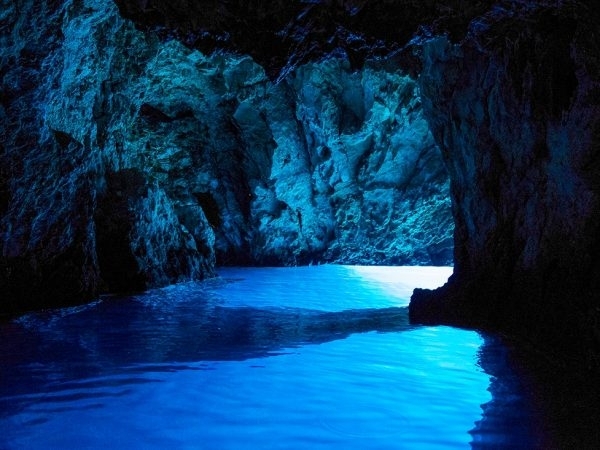 Sunlight passes through a hole that reflects on the white bottom and illuminates the cave with blue and silver light. Next station is Komiža, a small fishing village located on the western side of the island of Vis. Use yours to the Stiniva Bay, one of the most famous coves in the island of Vis. Stiniva is specific because of its natural appearance, and the legend says it was a collapse of leisure time here to discover this authentic place. Some attractions to visit are the Fortress of the Venetian Fortress, Fortress Batarija and many others. After a short break we will continue the cave. The entrance from the sea is only 4 meters wide and gradually expands to the stunning beach. Due to the solid entrance it is not possible to enter the bay with a boat, but you can simply swim. Afterwards we will visit another special place on the Green Hill on the island Ravnik. This cave is known and special because of the holes on top. When the sun is high, light comes through the hole and illuminates the cave green and silver. Swimming is allowed inside so do not forget to jump into "green" water and make your visit perfect. Before our last destination (the town of Hvar) we stop on the island of Budikovac. This island is uninhabited and full of amazing coves and pebble beaches. We take you to one of the beaches so you can relax in crystal clear waters or simply lie on the beach. While sailing to Hvar, you will enjoy a wonderful view of the Pakleni islands located in front of the town of Hvar. Pakleni are groups of more than 20 islands and rocks, unique and most recognizable natural beauty of the Adriatic coast. In the end, we will reach our last destination - the town of Hvar - which boasts the most beautiful arch in the world. 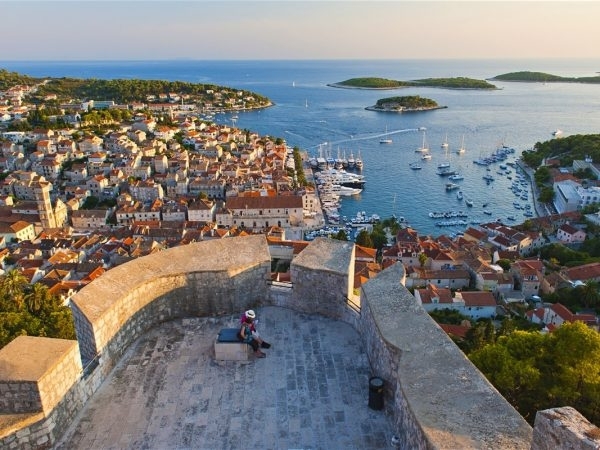 Hvar is a favorite destination for people from all over the world and even for some famous people because of their long history and rich cultural heritage. Here, if you want, you can dine in the traditional Dalmatian restaurant, indulge in sightseeing or stop at the main attraction of the town - Fortica fortress. Fortica Fortress has an amazing view of Pakleni Islands and the city. Remember this view because it will be the last place we visit and follow you back to Trogir. - In the event of bad weather conditions or harsh weather conditions, we reserve the right to change the route or cancel the tour for the benefit of all passengers. This decision is made by the captain. In that case, you have the right to redirect the trip (another day) or to receive a refund in accordance with the General Terms and Conditions.